Update, March 1: Gwent: Arena is live now. Arena mode has arrived in Gwent. CD Projekt Red announced the new mode in a YouTube trailer published yesterday. Deal with it. Here’s the best card games on PC. The trailer stars The Witcher 3’s creepiest character, Gaunter O’Dimm, and promises riches beyond belief, as long as you sign Gaunter’s contract. Of course, there’s always a catch, and you’ll have to fight to earn your gold. The new Arena mode requires you to first build a deck from cards across all five Gwent factions (six if you include neutral cards), and then play against opponents one-by-one. Your run comes to an end if you lose three games, or win nine. The more matches you win, the higher your rewards. It’s a little confusing to have to deal with all those cards at once, especially if you’re more familiar with some factions than others, but it’s a handy way to level the playing field if you don’t own loads of cards. As well as the arrival of Arena mode, the new update heralds the arrival of ten new Gold cards. Golds are the most powerful cards in the game, often including impactful bonus effects as well as their score, and are based on recognisable characters from the Witcher series. This time round, Yennefer, Triss, Dandelion (twice), Imlerith, and, of course, Geralt, all make an appearance. You can check out all the new cards here. 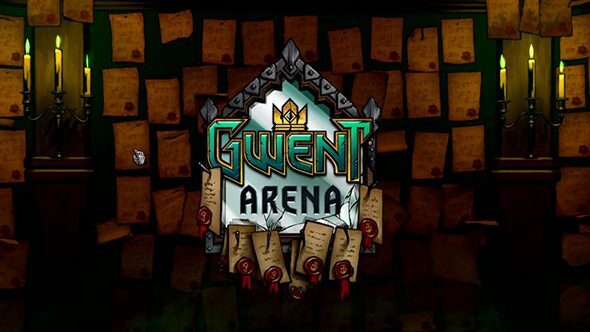 Update, February 13:Gwent Arena is coming soon. CD Projekt Red have detailed the new game mode coming to Gwent, and as expected it’s a draft feature. Gwent Arena functions much like the similarly-named modes in Hearthstone and The Elder Scrolls: Legends, offering a limited game mode that has you building a deck from random cards and making use of that deck across a series of matches. Gwent Arena will cost 150 ore or $1.99 to buy into one run, where you’ll attempt to complete nine “contracts” – matches against other players. Your run ends after you’ve completed every contract or you’ve suffered three losses. Completing all nine contracts guarantees a random premium legendary card, and you’re guaranteed a keg for entering, whether you win, lose, or quit. Card picks come in pools of four of the same rarity, and picks can include premium cards. Your leader pick comes at the very end of the draft. The deck you build will have no restrictions on factions, duplicates, or card rarity. Original story, February 13:Gwent players havewanted a draft modefor the Witcher-themed card game since its beta release last year. Now it seems developers CD Projekt Red might be granting their wish. CD Projekt Red shared a new game mode teaser for Gwent which hints that a draft mode is coming to the game. The teaser starts with a collection of tweets to the developers asking about draft mode, followed by various streamers saying what a great addition arena mode would be to the game. The video then ends by saying the new game mode is “coming soon” and an official announcement will be made tonight. It’s very likely the new game mode is draft mode. If not then CD Projekt Red are the best trolls in the business. But what is draft mode? If Gwent follows the same style as Hearthstone’s Arena, draft mode would be a form of competitive match that sees you compete against others using specially constructed decks. In Hearthstone, a hero is picked first – however, this may be a faction in Gwent. You are then presented with a number of cards based on the faction or hero you chose. These cards are broken into collections of three, in Hearthstone’s case, with you only being able to pick one card from each set. The others are effectively discarded. This continues until each player has a full deck. Gwent’s draft mode will not be exactly the same Hearthstone’s. For one, it may not cost money to enter as the game is still in public beta. There will likely be many other small differences, too. If you want to find out more then make sure to tune in for the official announcement on CD Projekt Red’sTwitch channeltonight at 21:00 CET (20:00 GMT).